This Pinup Photo was added on Friday 07 June, 2013. Thumbnail above is Watermarked. The B-25 Mitchell made its claim to aviation fame with the daring attack on the Japanese homeland from the USS hornet aircraft carrier during the Doolittle Raid. This medium sized bomber was also used as an attack aircraft because of it's size and saw action in both theaters in the war, though it's often seen more as a Pacific theater aircraft. The Dietz Dolls Keep 'Em Flying Pinup series is based on World War 2 era postcards that were produced featuring top aircraft at the time and the branches the aircraft served in. 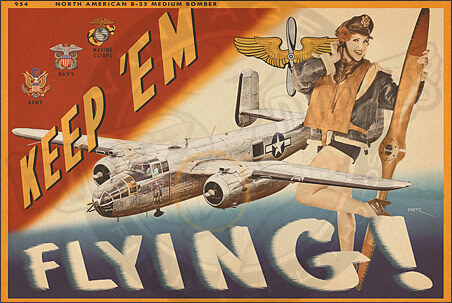 These postcards were used as propaganda tools to encourage the wartime production of aircraft. Now, you can own reproductions of these postcards with a pinup twist! They look great in larger sizes framed! Your METAL is on the attack!